Take classic 1950s Art Deco style, combined with simple and solid mechanicals, and you have the Smith Corona Sterling. There’s nothing fancy about this typewriter, it just works. The round corners and green keys make this an inviting machine. Your fingers naturally fall into the deep cups of the keys. And when you start typing, the typebars move with a surprising lightness. When you flip this typewriter over, you can see why. There’s not much there! It has exactly what it needs to work, nothing more. Which means that after these many decades, it still works like the day it was purchased. Because it types so effortlessly, this is a real speed demon, like one of those 1950s roadsters. The carriage return lever has a nice curve to it and sticks out far and has a big paddle on the end. When the words are flying, you can’t miss this thing, unlike other portables which tend to minimize this lever. Hi! That racheting sound could probably be fixed with a small adjustment. If you look under the carriage you can see a thin metal bar the length of the platen that looks a little like a comb. On both ends there probably a couple of screws holding it to the carriage. The teeth of the combs catch a gear in the center of the machine. Now, that comb may not be catching the gear properly, i just adjusted my Olympia by loosening the screw on both sides, just enough to get it to move but not release. I pulled it down to seat in to the gear a bit more. Once adjusted i re-tightened the screws. I hope this helps. Unbelievable. I have this machine as well. It was my Grandfather’s. Which do you prefer for manuscript writing the lettera 32 or this? I must get this one professionally refurbished, if you think it is worth it. Either of these work great. I love the Lettera 32, which feels more like a laptop. For me, it just comes down to personal feel and what you like to look at. Personally, I regularly use an earlier model of the Smith-Corona Sterling, from the 1940s. It has glass topped keys, which feel great. Solid. I have this typewriter as well. One issue I have with it, however, is that the machine moves around a lot when I type. Is this a common problem with portable manuals? The rubber feet have probably become hard. It shouldn’t move around. I’ve replaced them with new rubber that I found at Ace Hardware and some super glue. Not original, but keeps it stuck to the table. How do the newer Smith Corona’s (such as the Galaxy Twelve, Sterling II – brief revival production run in the 1970’s) compare to the Olympia SM9, Hermes 3000? 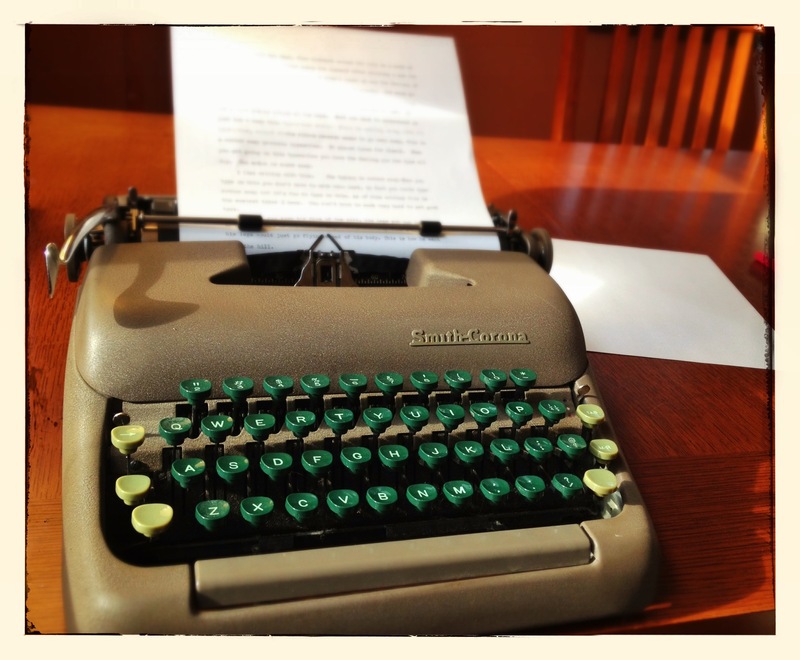 I want my typewriter to be reliable, durable, quick (not sluggish, or hardtop-the-touch? Harvey, I had a Galaxy Twelve a couple years ago. Nice machine. Seemed adept enough. Something you’d send your kid to college with. Good for banging out a term paper. But if you’re after something a bit more inspiring, it left me with a dull feeling. A cheapness crept into Smith Corona by this time. Not bad, but when you’ve used an SM9 or Hermes 3000, you can feel the difference. For the criteria you’ve listed, I’d go with the SM9. Olympia finally went to the basket shift. But the machine is so plain looking! I’ve got a Tower President that’s basically a ripoff of this line. It’s great, but the keys to move at an angle instead of straight up and down.